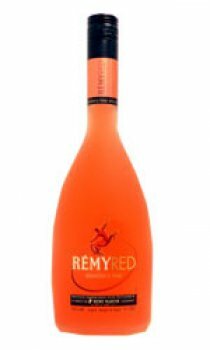 RemyRed symbolizes the energy of new desires. In new stylish, sophisticated, curvy, frosted bottles, its three seductive fusions of fresh, sweet fruity flavours - blended with a touch of Remy martin Cognac - produce smooth, sophisticated liqueurs that generate passion and excitement. With its irresistibly vibrant colours and flavours, RemyRed is poised to become the beverage of choice to a new generation of young, urban cocktail drinkers. Strawberry kiwi infusion combines strawberries and kiwies with hints of orange blended together with a touch of Remy Martin Cognac to produce a luminescent hue of pink.